Will the tropical land biosphere dominate the climate–carbon cycle feedback during the twenty-first century? Global warming caused by anthropogenic CO2 emissions is expected to reduce the capability of the ocean and the land biosphere to take up carbon. This will enlarge the fraction of the CO2 emissions remaining in the atmosphere, which in turn will reinforce future climate change. 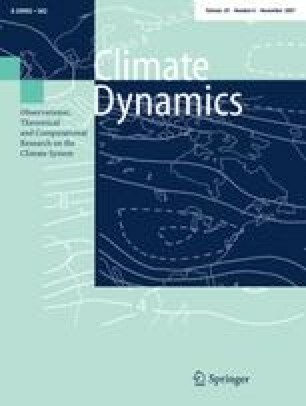 Recent model studies agree in the existence of such a positive climate–carbon cycle feedback, but the estimates of its amplitude differ by an order of magnitude, which considerably increases the uncertainty in future climate projections. Therefore we discuss, in how far a particular process or component of the carbon cycle can be identified, that potentially contributes most to the positive feedback. The discussion is based on simulations with a carbon cycle model, which is embedded in the atmosphere/ocean general circulation model ECHAM5/MPI-OM. Two simulations covering the period 1860–2100 are conducted to determine the impact of global warming on the carbon cycle. Forced by historical and future carbon dioxide emissions (following the scenario A2 of the Intergovernmental Panel on Climate Change), they reveal a noticeable positive climate–carbon cycle feedback, which is mainly driven by the tropical land biosphere. The oceans contribute much less to the positive feedback and the temperate/boreal terrestrial biosphere induces a minor negative feedback. The contrasting behavior of the tropical and temperate/boreal land biosphere is mostly attributed to opposite trends in their net primary productivity (NPP) under global warming conditions. As these findings depend on the model employed they are compared with results derived from other climate–carbon cycle models, which participated in the Coupled Climate–Carbon Cycle Model Intercomparison Project (C4MIP). This research was financed by the German Ministry for Education and Research (BMBF) under two DEKLIM projects, grants 01LD0106 and 01LD0024, and by the European Community under the CYCLOPES project. The simulations were performed on the NEC SX-6 supercomputer installed at the German Climate Computing Centre (DKRZ) in Hamburg. We thank all C4MIP participants for contributing their model results and numerous helpful comments.